We were thrilled to finish the Melbourne Cup carnival with a 3rd placing in the Group 1 Patinack Farm Classic down the Flemington straight with ORTENSIA. She went first up into the race and whilst there was only a small field it was very select with the best sprinters in the country taking part. ORTENSIA was ridden by regular rider Craig Williams who knew that with the small field it was going to be a race of tactics. The media had the race down as a match race between Black Caviar and Haylist who both of their form throughout the spring warranted such hype. We however had ORTENSIA going into the race and we couldn’t have been happier with her preparation leading into her first up run. With the rail out as we have seen most horses are happy to go straight down the middle of the track. We had drawn the widest and we were happy to get back and have one last crack at them in the end. The race was not run totally as predicted with Haylist unable to stick with Black Caviar throughout. One thing that had been predicted by many was that Black Caviar was something special and this was proven to be correct. Throughout the run we were very pleased with ORTENSIA and for her to run the way she did and to dig deep at the end to hold onto third proved what a talented and gutsy mare she is. Tony Noonan was extremely pleased post race ‘She ran a massive race, she is first up and the others are rock hard fit and for her to run third in such a tough race is great effort’. ‘I will now look at her options and discuss with her owners where she will head to next. After her Saturdays run I can’t wait to her next start’. Congratulations to her owners Alister Fraser and Emma Ridley who have been very patient and hopefully now another major win is not too far away. On Thursday at Flemington we were also really pleased with the third placing of CANDY STRIPES in the listed 1200m race in only her fourth race start. We had hoped to run her on Melbourne Cup day in a 1400m but we were an emergency so we raced on Thursday. We thought that the distance of 1200m would be to short but to see her finishing off so well was very pleasing. We hope that there is a win for her owner Lindsay Williams in the not to distance future! 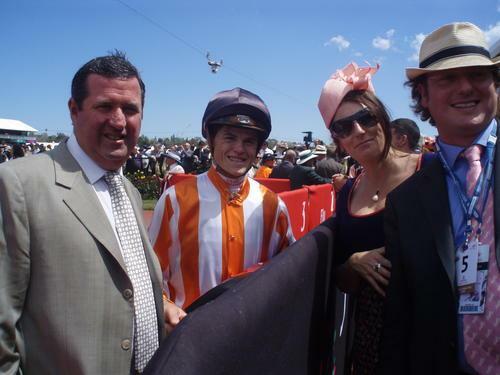 Picture L to R: Tony Noonan, Craig Williams, Emma Ridley and Alister Fraser post race.